Thanks for having me, Katherine. 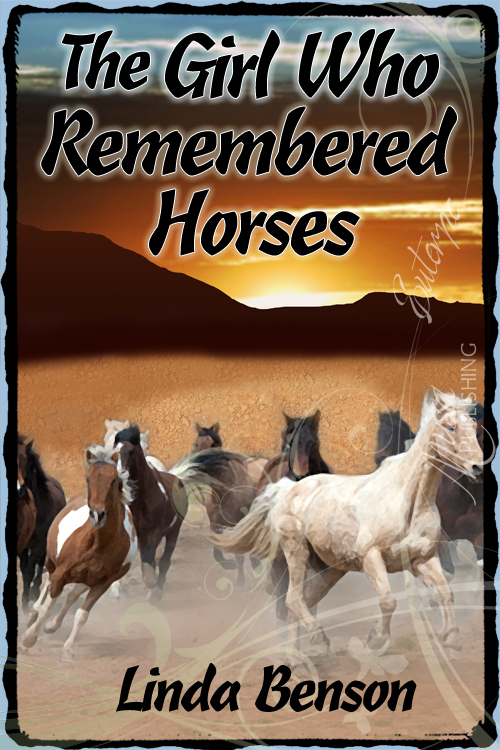 My newest book is set several generations in the future, when few remember horses or their connection to humans. Except for one girl, Sahara, who has recurring visions of riding astride on magnificent animals that run like the wind. In a world that has forgotten the ancient bond between horses and humans, can one girl’s dreams make people remember? Sahara travels with her clan in a barren environment where recyclables are bartered for sustenance. With the help of Evan, a young herder from the Gardener’s Camp, Sahara discovers a crumbling book containing pictures of humans riding horses, and discovers that her visions are real. Confronting a group of hunters led by hot-headed Dojo, Sahara rescues a wounded horse, but the animal escapes before it can be tamed. Sahara is labeled a foolish dreamer and almost gives up her quest. Following horse tracks into a remote ravine, she finds wild dogs attacking a wild mare and must drive them off in order to save the foal. Now she must attempt to raise the young animal, finally convince her clan of the ancient bond between horses and humans, and learn the secret of her true identity. This book had its start over six years ago, in 2005, right after Hurricane Katrina and other natural disasters got us all wondering how we might live if some horrible calamity changed everything we knew about the world around us. Concurrently, as a horse woman, I noticed the changing status of horses around us, brought on by economic conditions and the fact that more and more of the human population are becoming urban dwellers. So this was the seed of the story, the idea that began this novel – what if that bond between horses and humans was actually forgotten? Add to this my own interest in why some women are so fascinated (shall we say – obsessed) with horses, which led me to pursue a college research project called “American women and their passion for the horse.” Why, indeed, are some of us so Horse-Crazy? Is it cultural? Passed down from generation to generation? Or possibly genetic? This mixture of fact and fantasy, research and wonder, and my long years as a horse person led me to explore these concepts through fiction. The result is The Girl Who Remembered Horses, which is billed as Young Adult, but perfectly readable for ages 9 to 109. Although the bond between horses and humans is ancient, it is also fragile, and I believe horse people in particular really identify with how dreadful this world might be without the knowledge and friendship of these wonderful animals. The Girl Who Remembered Horses is available through Amazon, Barnes & Noble.com, and most online booksellers. The Girl Who Remembered Horses has its own Facebook page. To learn more about Linda and her other books, including two new books due for release in 2012, visit her website or her blog. And here’s a question for readers of this blog – Can you imagine a world without horses? Previous book post: Keeping Secrets by Maggie Dana, reviewed by Ellen Broadhurst. I’m halfway through reading this fascinating book so I didn’t read Linda’s synopsis, just the other bits about what inspired her to write the story. Dystopian fiction is a favorite of mine, and when it includes horses, that just makes it all the better. And no, I cannot imagine a world without horses. I sincerely hope they outlive us all. Thanks so much for hosting me on your blog, and allowing me to talk about the beginnings of this novel. I was lucky enough to find the moment in my journal when I first had the seed of an idea for this story, including the title, and it was indeed in 2005. It’s rather ironic how the novel features an ancient “crumbling book” and here we are this many years later, and the story is first being published as an eBook! I hope it will be out in print at one point, however. But for now, start up your eReaders, download it in seconds, and enjoy! And although I wrote about it and imagined it, I hope I never see a world without horses. Let them always wheel freely across the plains! Fascinating premise for a novel. Cannot wait to read it! I’m reading the book right now. What a neat concept! Thanks for sharing the story! This sounds like a fascinating book. The title alone is magnetic! I’ll be putting this on my list for sure!